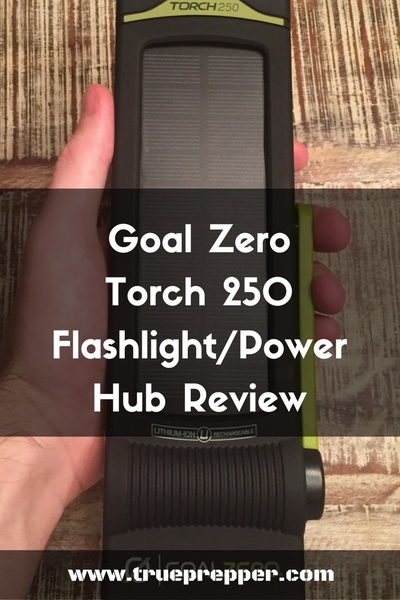 Goal Zero provided us with a Torch 250 to test out and review. It arrived quickly in a medium sized box. The packaging is nice, simple, and informative. The only contents of the box is the Torch 250 itself and a small instruction manual. 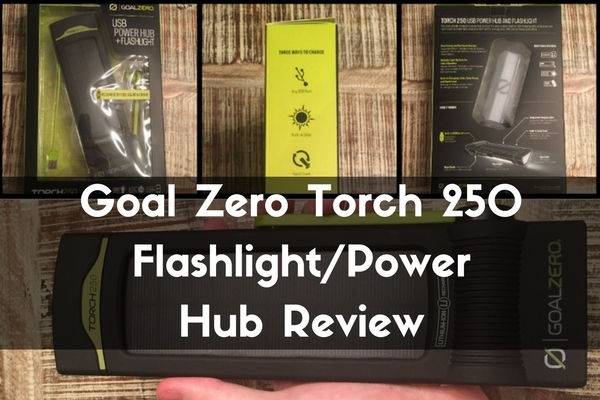 The Torch 250 seems like a bulky flashlight at first, but it is an engineering feat. 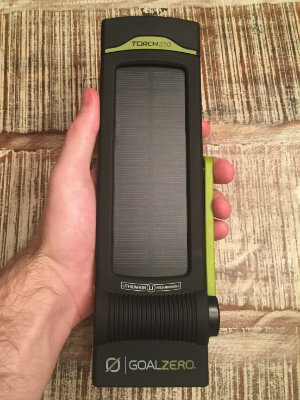 The ability to charge the flashlight with a crank is nothing new, but the integrated solar panel attached to a high quality lithium ion cell makes this one of the most useful tools in the arsenal. While having a light available at any time is important, the true functionality of this tool is with the ability to charge anything with a USB cable. As we grow more connected with smartphones, laptops, and tablets the ability to keep these tools charged in emergency situations is important. The integration of the solar panel caused the flashlight to be bulkier but the ergonomics are still sound. When you hold the flashlight, it is not as cumbersome as you might imagine. The asymmetrical design allows you to position the flashlight so the solar panels are directed straight at sunlight. The various flashlight modes cover a wide variety of needs. The Torch 250 provides a lantern floodlight for camp, a spotlight for handheld carrying, or an emergency signal flashing red light. 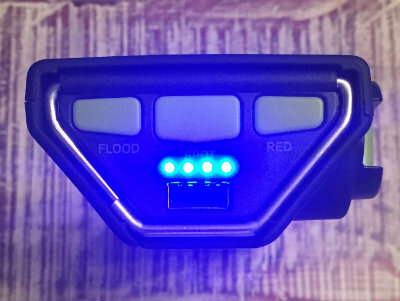 You can interestingly have the red lights, LED spotlight, and LED floodlight all on at once if you ever have a situation where you need as much light as possible. The Torch 250 is well made and the perfect addition to any kit to compliment your communication and information resources. The 18650 lithium batteries have an almost cult-like following due to their high performance. They can also be found in high performance cordless tools, Tesla cars, and laptops. When these batteries are paired with the integrated solar panel, it provides you with virtually limitless power. The nylon casing is sturdy in your hands, rugged, and water resistant. The instruction manual can be tossed when you receive the Torch 250, because the functions are very intuitive. It is all plug and play and the different light buttons are labeled. 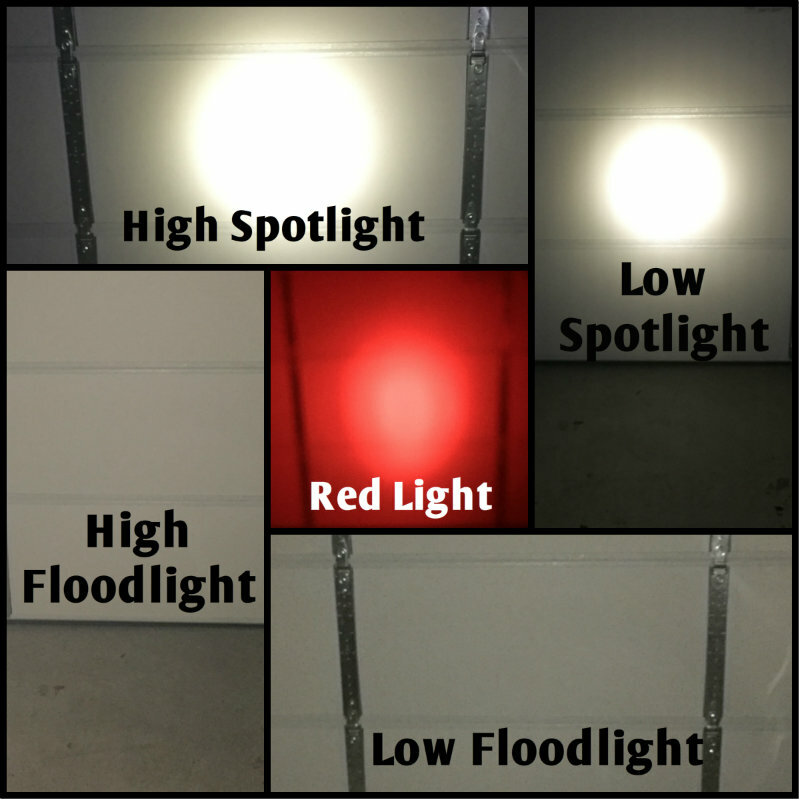 The LED lights are very bright on high and have a long run time on the low setting. The listed operating temperature gave me concern at first, but the Torch 250 cooked on my dashboard for a few days and performed fine (and charged) afterwards. The crank handle is plastic, which may have some problems with prolonged use, but Goal Zero has an exceptional 12 month warranty policy. Also, I would expect to only use the crank as a last resort since USB charging and solar charging is almost always preferred, and the handle is plenty sturdy for occasional use. Speaking of solar charging, some other reviews have complained about charge time for a full charge off of the integrated solar panels. I find these claims to be out of touch with modern capabilities, and find it impressive that this can charge a 48 hour floodlight in less than 24 hours of sunlight exposure. If you do need a faster charge, I would suggest picking up a Goal Zero Nomad listed below under Torch 250 accessories. 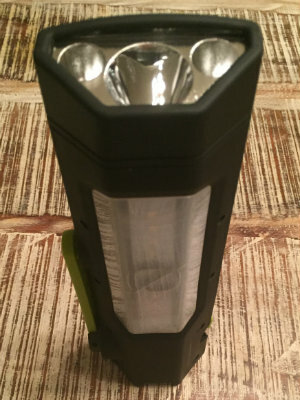 At TruePrepper we recommend the Torch 250 flashlight as a great addition to a Get Home Bag, Bug Out Bag, or Disaster Kit. It’s functionality makes it useful for a variety of situations. Keeping your electronics charged with the integrated solar panel boosts your communication and information resources immeasurably. And having a light always available is not bad either.